Telerik has decided to get in on the fun and offer a very exclusive PDC badge, only for the most worthy of PDC attendees. 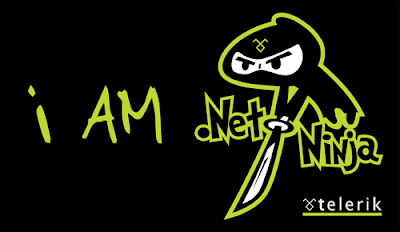 Based on the popular Telerik ".NET Ninja" t-shirt (which we will also be giving away at PDC), the "i am .NET Ninja" badge will truly be the badge to collect and show-off in your PDC badge holder. To get yours and tell the world your are a .NET Ninja, stop by the Telerik booth (#401) and we'll welcome you to the dojo! Visit the Telerik PDC booth...online!